The summer heat can be as simple as hanging out in an air-conditioned room, but the lure of a pool can often be too strong for us to stay indoors. For those looking to invest in building an inground pool, the task can be daunting in terms of all the variables: the pool’s location, its size, its configuration and how it relates to the house, not to mention its surfaces, both in and around the pool. This ideabook presents some modern yet varied pools, highlighting some of the various elements to consider when designing a pool. Locating a pool close to a house can have numerous benefits. 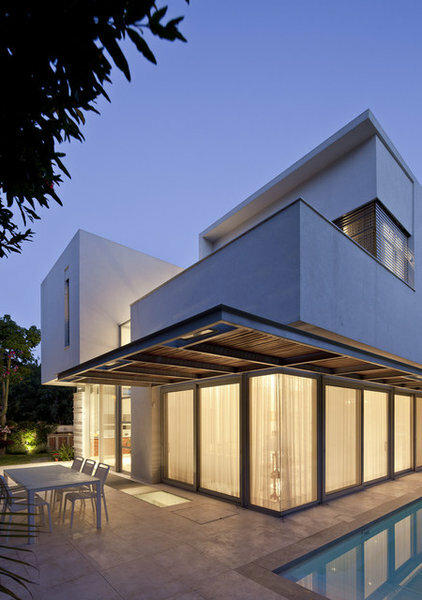 This example illustrates a couple: Sunshading attached the house can serve the pool and the adjacent deck; and the deck itself can serve both the house and the pool. Looking toward the house with the pool at lower right, note how the glass walls are sliders, allowing the inside and outside to merge. This makes a lot of sense with the pool only steps away from the house. From inside the house another quality is evident: The light reflecting off the water creates a dappled pattern, here hitting the pulled curtains. This pool in Florida is logically placed in the courtyard of a U-shape plan. This makes the pool the focus of the outdoor space, but also an impediment. The stepping stones deal with the latter. The stepping stones also align with the separation between two pools. The smaller pool on the left is a hot tub, while the longer one on the right is a lap pool. 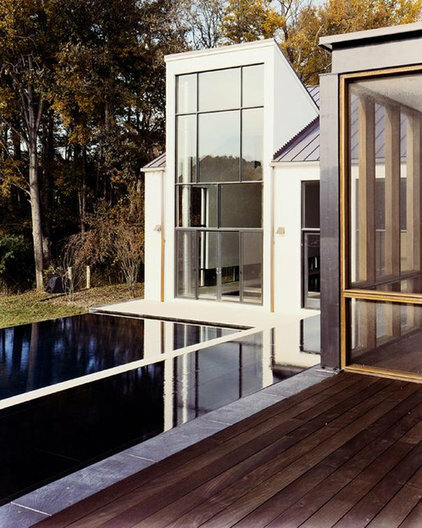 The integration of the pool with both the outdoor and indoor spaces of the house is extraordinary. It’s hard to think of the house without the pool. 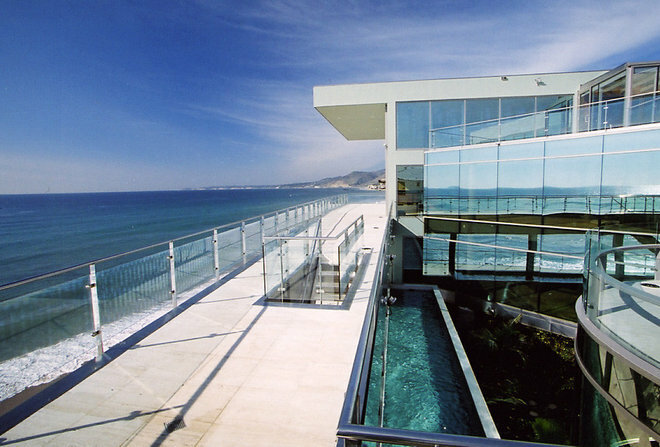 Covered terraces are oriented to the water, and glass walls slide open to connect inside and outside. 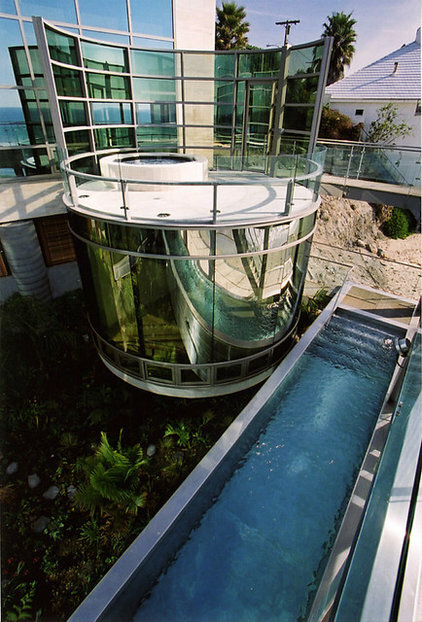 This above-ground lap pool in Malibu, California, is a tight squeeze, inserted in a gap between a circular drum (at right) and a catwalk. Another view of the pool shows how it relates to the drum (which has a hot tub atop it) and the beach below. One more view, from the catwalk, reveals the odd space into which the pool is inserted. 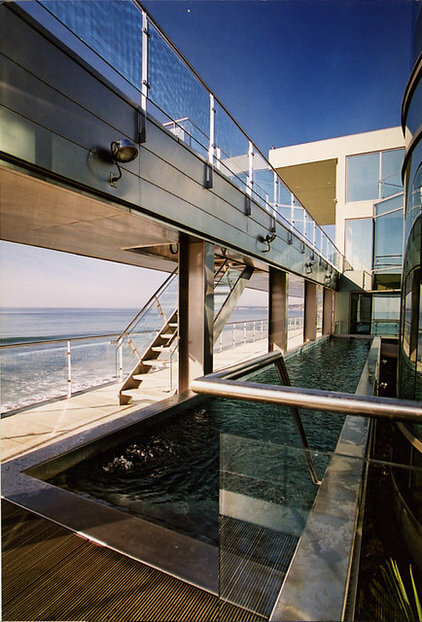 Its location affords a view of the ocean beyond, through the opening under the catwalk, but it also lends the pool a sense of privacy and enclosure. Here is a guesthouse and a swimming pool with an observation tower located on a historic dairy farm. The pool is terraced down from the house and enclosed by hedges to give it some privacy as well. 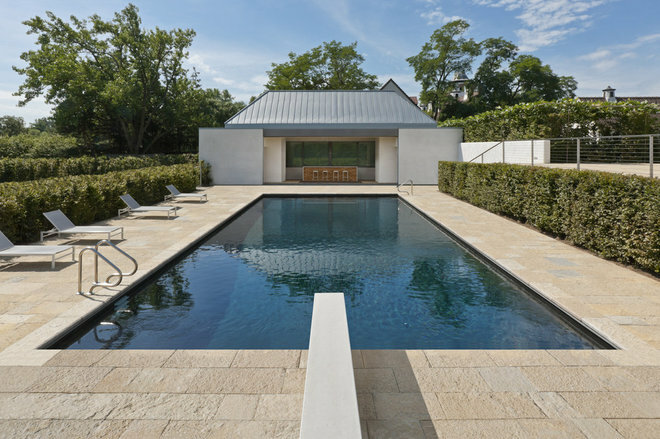 The pool is aligned with a pool house, an important consideration when siting the pool away from the main house. Unlike the previous example, this deck is slightly above the level of the water. 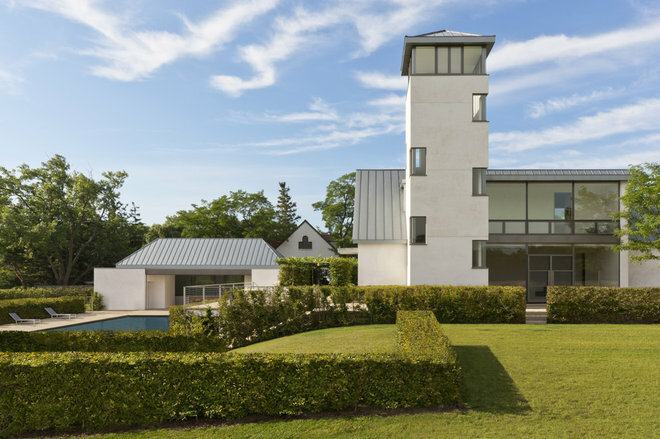 A couple areas are tacked onto the rectangular shape of the pool, one providing a place for repose (right) and one integrating the steps to the deck (left). The pool’s location between the two-story house and a solid fence give it plenty of privacy. Sometimes an outdoor pool is an extension of an indoor pool — not literally, in terms of water, but in terms of plan location. This house in Washington, D.C., has an indoor pool just beyond the glass wall, aligned with the outdoor lap pool seen here. Warm days invite a dip outdoors, while chilly days might keep one inside the light-filled space. 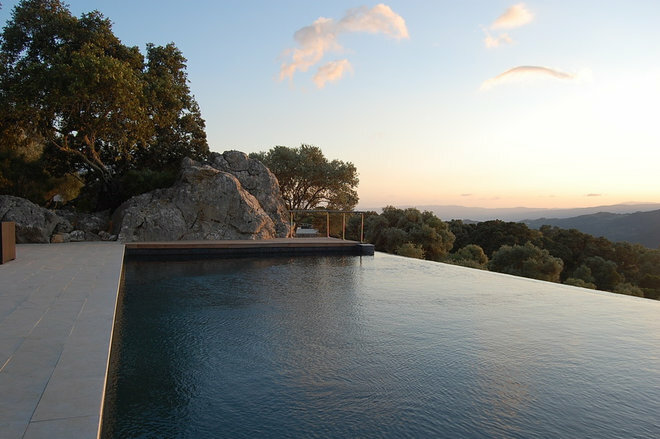 A few striking pools end this ideabook. Here is one with a “window” on one side to reveal the swimmers underwater. Last is this hot tub in Arizona, since summer is relative in some parts of the United States. Hot and arid Arizona can get quite cool at night, so a warm place to soak is called for. 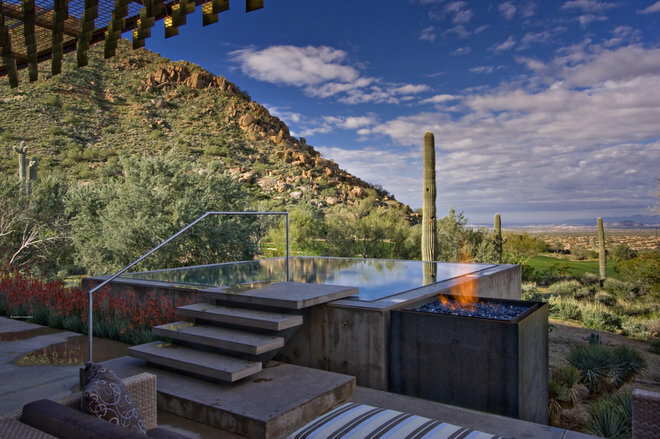 This design immerses bathers in the desert surroundings.